I can’t do this. Can’t capture such a great spirit in mere words. Or describe the emptiness of his empty paddock. I just want to say that in his last hours he was with people he knew and trusted, on a mild night under a starry sky. He ended his life peacefully. We caught the colic symptoms early, Dr. Waldridge got there soon with pain relief and gave heroically of his efforts and expertise. Everything that could be humanely done to try and save Ogygian was done, and Ogygian was strong and loving through it all. My gratitude to Michael is beyond bounds. 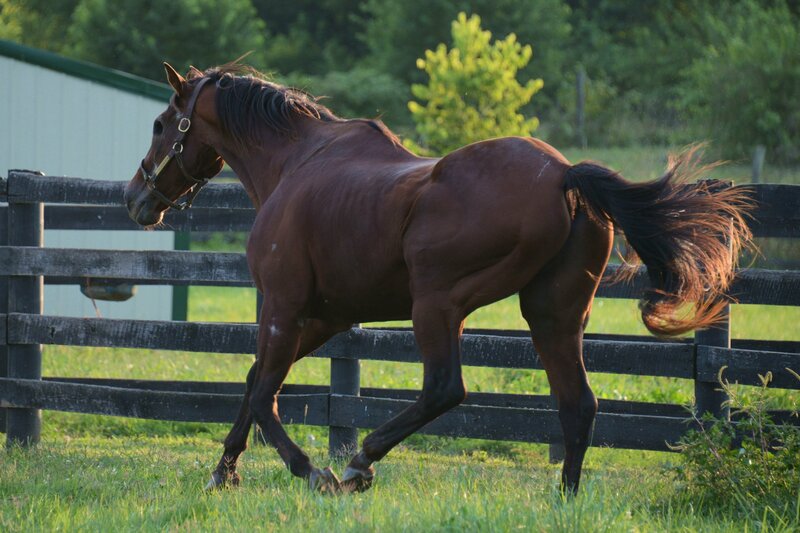 He made the right decision not to opt for radical hospital treatment that had little chance of working, to let Ogygian go peacefully in the paddock that had been his kingdom for so many years. To make all the caring decisions he made that night. Ogygian left life the way he lived it, with courage, wisdom and a loving heart. I will never know another like him. Ogygian’s halter. Sitting on my dining room table, it looks forlorn and more than a little lost, just like those of us who knew and loved O became on Saturday night. 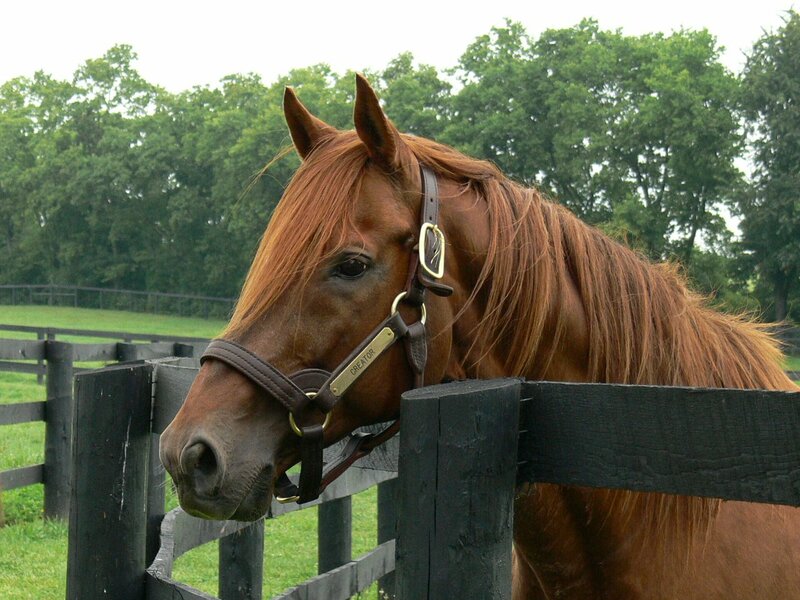 In a lot of ways, his halter symbolized O. It had longevity. 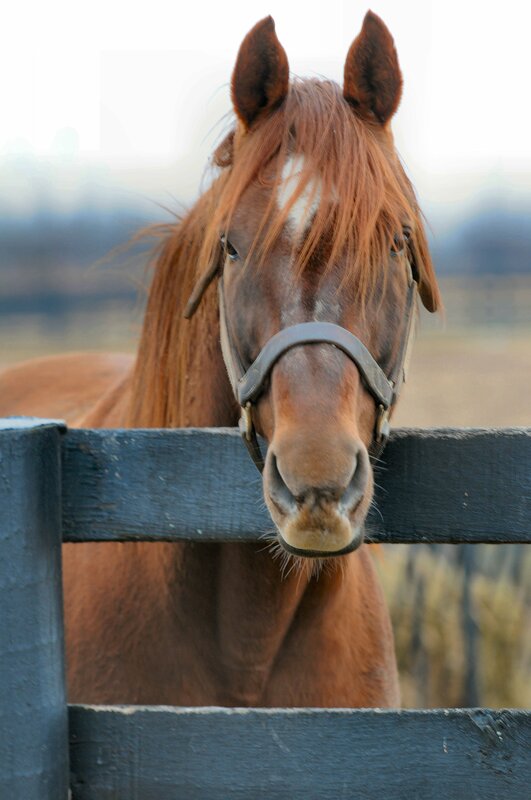 O was famous for cleverly ditching every halter put on his head. Four or five years ago, as my bond with O was growing and after the latest ditching, I decided to try my luck. O’s constant companion, Beth, and I deliberated over the most comfortable size and the ideal font type to use on the nameplate. Everything had to be perfect. I can’t recall the details of either, but something about this halter worked for O. With Michael’s coaxing, on it went (of course, Michael was the only one who could actually accomplish this), and we waited to see how long it would last. As it turned out the halter had staying power, just like O.
O, Beth and the Halter January 2015. Photo by Laura. O traveled over 14,000 miles during the course of his life, until he settled for good at Old Friends. His halter looks like it’s been around the world and back, too. The nose band is a little warped, the ends of the straps are curled up, and the nameplate is scratched and worn with age. It’s a halter with character, experience, toughness, fitting for a warrior, a survivor like O. O and his halter were never separated. Until Saturday night. And now, it sits on my dining room table. I think I’m going to give this halter to the person O loved best in all the world, Beth. I think that’s what O would want me to do. And I never turned down a request from Ogygian. For the past several years, Ogygian has been my “Saturday night horse”. 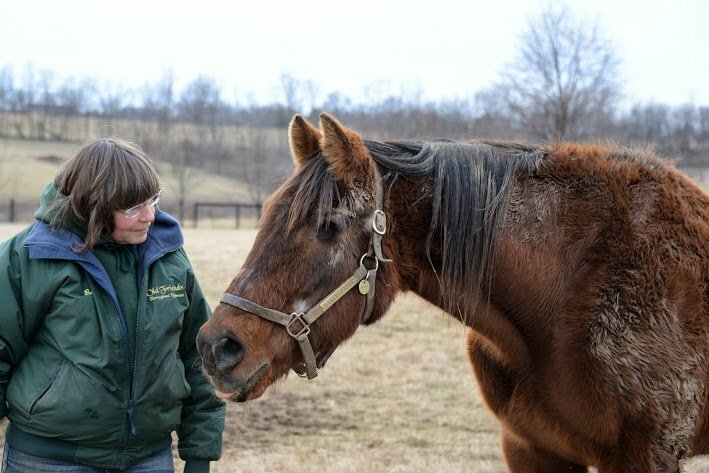 After the visitors go home, Saturday evenings are spent wandering the farm and visiting with the wonderful horses at Old Friends. One horse that was always part of the nightly ritual was Ogygian. He always wandered over for a visit with Beth, Barbara, Alex, John, myself, and whoever else was out in the evening. Ogygian was a very particular horse. Some things were only allowed if done in a special way. One of those things was the weekly application of a hoof-strengthening cream to his hooves. Beth couldn’t just go in and rub it in. Ogygian required a minimum of two other visitors, preferably female, to praise him and provide carrots while the cream was applied. It was usually Barbara and me cooing and praising as we passed carrot after carrot to him. 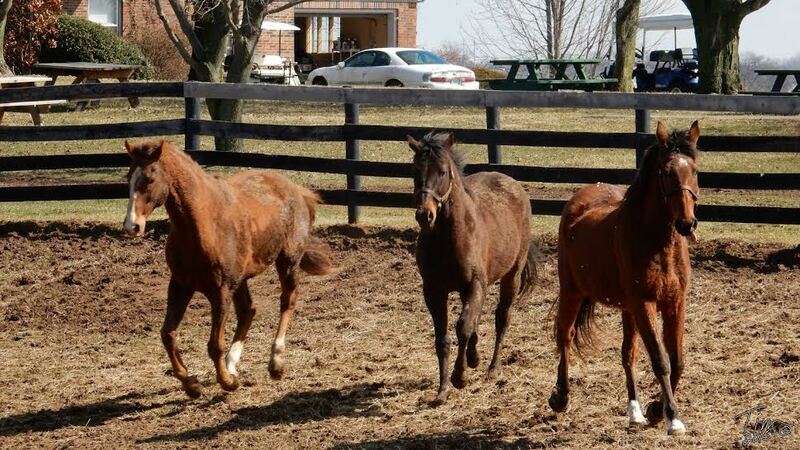 When someone was not at the farm, we would press John in to be part of Ogygian’s “harem”. In old age, O got an extra dinner to keep his aging body in good weight. 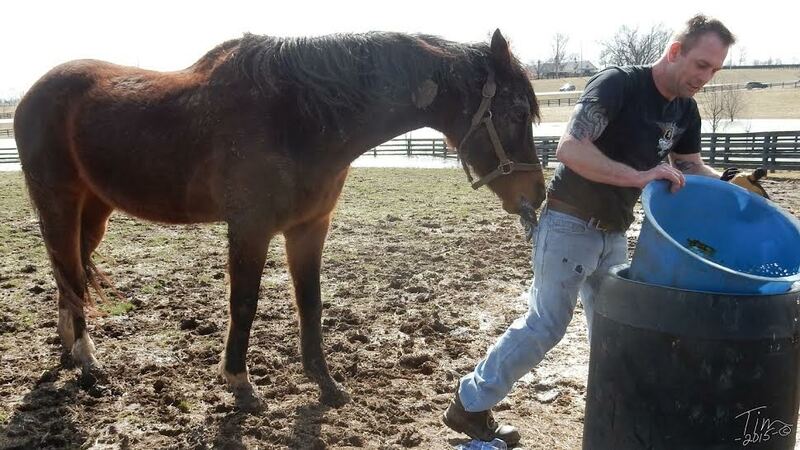 Beth would call him and they would race around the paddock to his feed tub. I used to try to get over to the feed tub first to get the right light for photos. 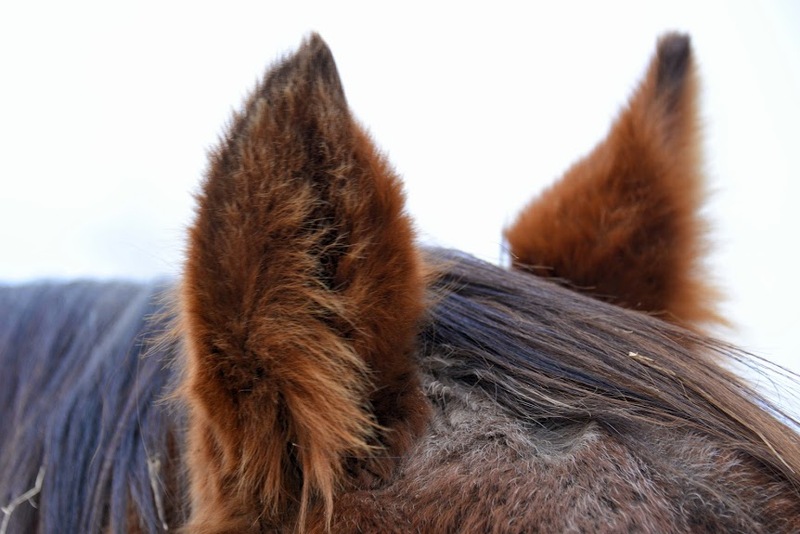 The sight of the old stallion with his mane and tail streaming behind him is forever etched in my mind. Race to the feed tub. Photo by Laura. O loved to stand in the back of his paddock under “his” tree. Sometimes, he would fade into the scenery. I remember bringing a tour over to see him one morning. I was looking everywhere for him and calling his name and just didn’t see him. I think he decided I must be blind as he started talking as he cantered across his paddock to the “oohs” and “aahs” of the admiring crowd. It’s a bittersweet time on the Kentucky farm. Feeling our losses keenly, we also feel the coming of spring. We’re only weeks away from the Keeneland meet, and then, Derby season. 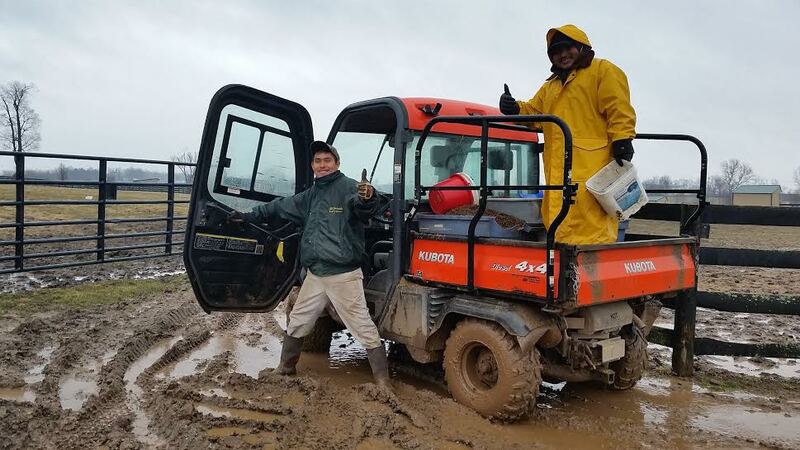 Preparations are underway, people are pitching in on all kinds of projects from Kentucky to New York to Florida to California and beyond, and on the farm, the maintenance needed after the harsh winter is underway…in the middle of mud, mud, mud. The unstoppable Antonio and Yoel. Photo by Tim Wilson. Flick had oral surgery to remove teeth that had caused him pain. 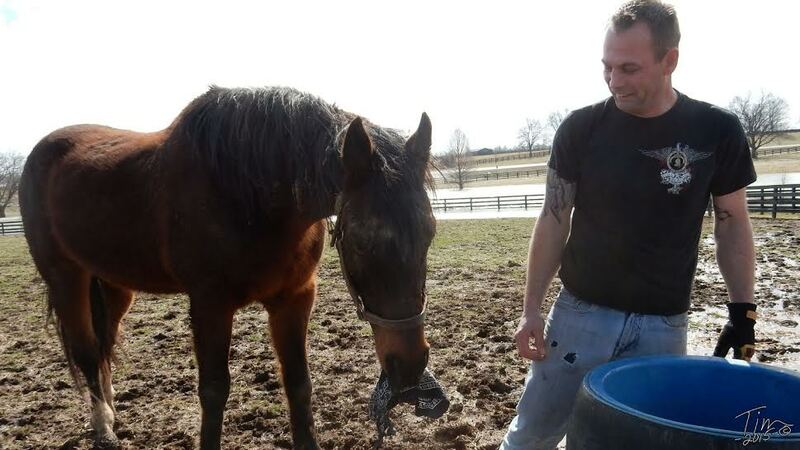 The surgery was performed by Old Friends veterinarian, Dr. Brad Tanner, of Rood and Riddle. The situation has been relieved, Flick is now recovered , and he’s back with buddies Danthebluegrassman and Unaccountable. Thank you, Dr. Tanner! Flick rejoins his buddies. R to L, Flick, Unaccountable, Dan. Photo by Tim. Do what?? Porfido. Photo by Laura. …Did somebody say, farm maintenance? It’s as inevitable after winter as taxes, but it can be a lot more fun, says Swan’s Way. …by swiping Trampus’ bandana. Photos by Tim. Few who saw Creator at Old Friends saw him race, but in the summer of 1990 he was the best horse running in Europe, a superlative athlete worthy of his great lineage: Nasrullah, Never Bend, Mill Reef. He was already a character. Later, one of his grooms in trainer André Fabre’s barn would tell Michael how they called Creator “Houdini” because no matter how meticulously they’d fasten on his blanket, the next time they checked on him they’d find the blanket on the stall floor. Creator’s easy victory over In the Wings in the Prix Ganay was especially celebrated. To this day, Creator is remembered in Great Britain. Here is his obituary in England’s Racing Post. 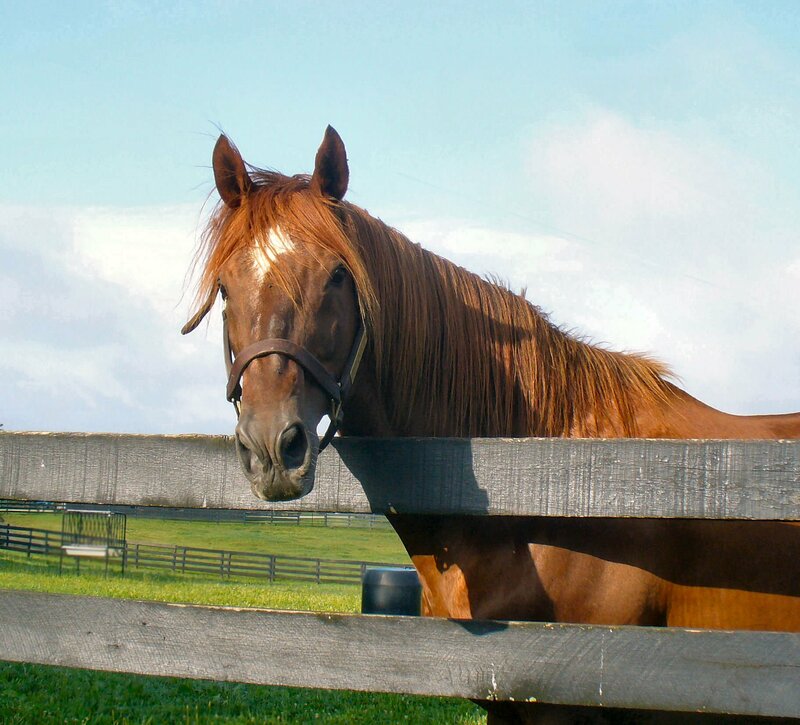 Creator at Old Friends, Hurstland Farm, 2005. Photo by Kate Dunn. 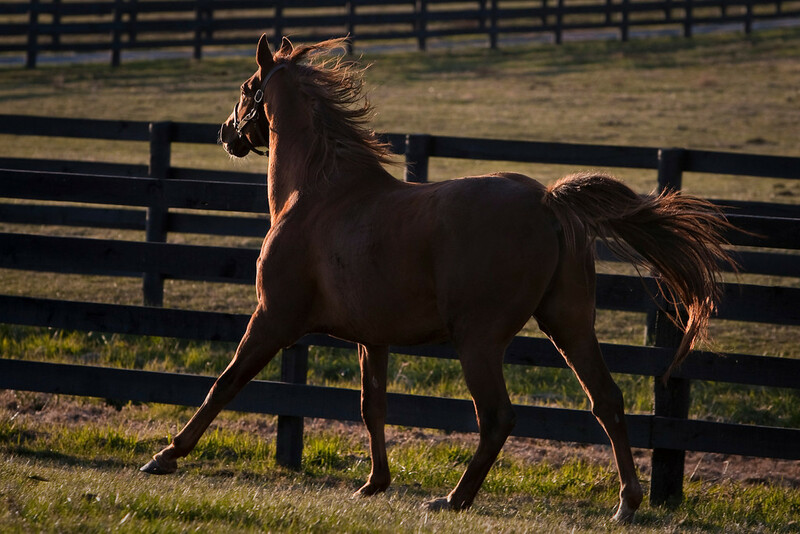 Pensioned from stud at Nitta Farm at age 18, Creator was purchased by Old Friends and arrived from Japan with Sunshine Forever on November 1, 2004. 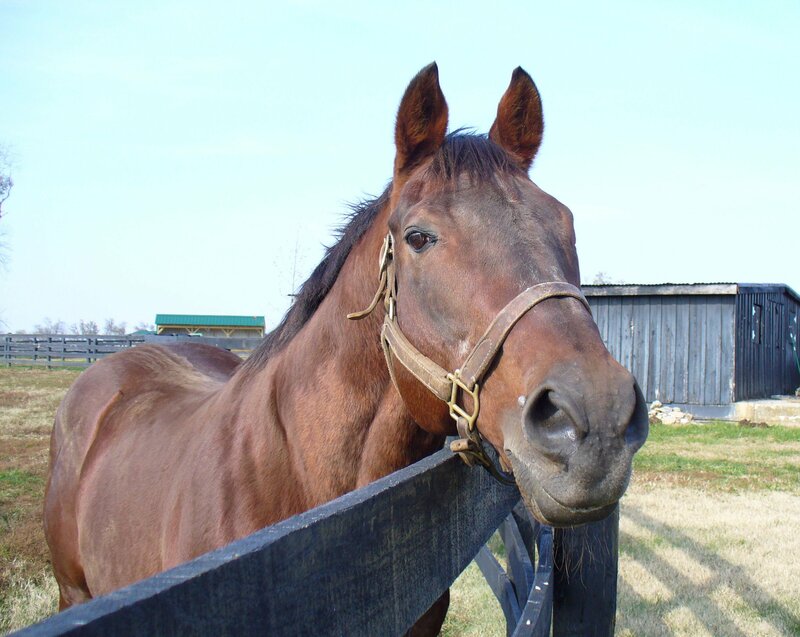 Though Old Friends acquired Sunshine Forever first, it was actually Creator who was the first stallion resident to set foot on Old Friends’ premises. He made sure of that by making enough ruckus on the trailer to get himself unloaded before Sunshine. It set an enduring pattern. Sunshine was our wisdom, Creator was our fire (a triumvirate completed when Jerry and Ann Moss donated Rulhmann, our toughness). 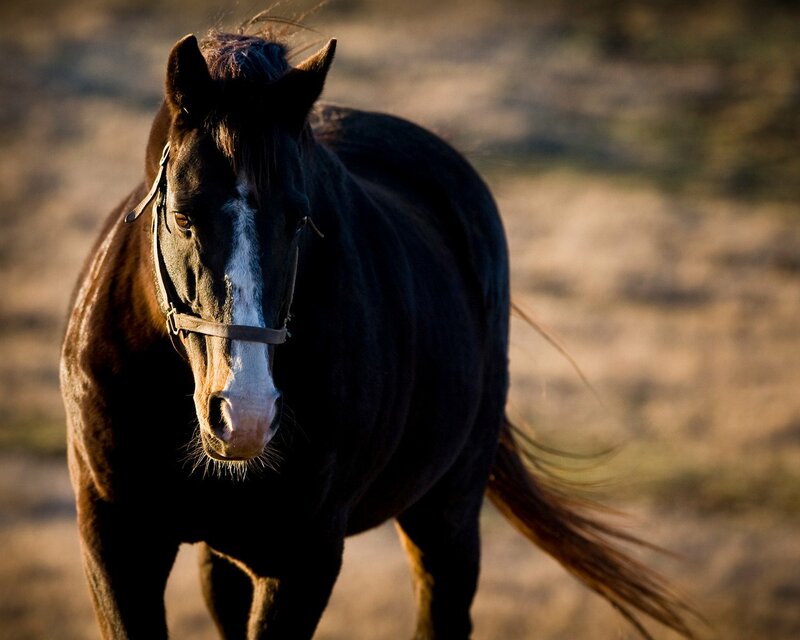 For more than a decade, with more than a hundred horses, there was no fire brighter than Creator. 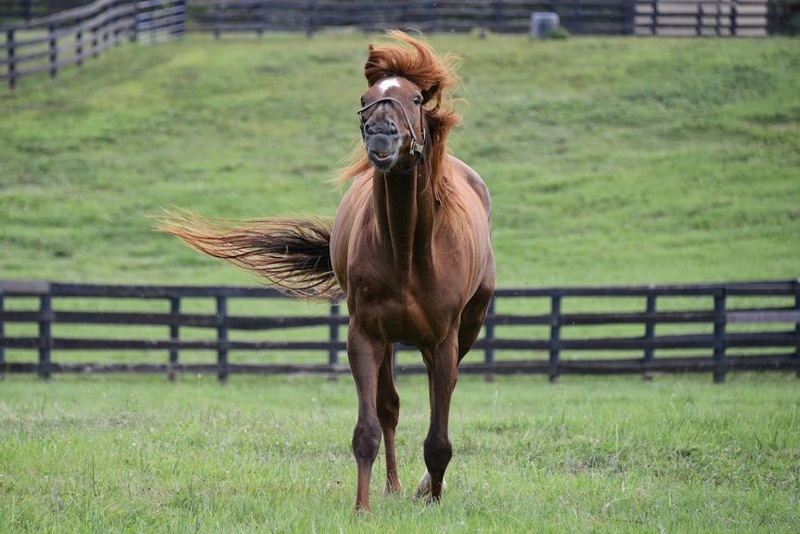 Whether running with the wind flaming his red mane and tail, wowing all who met him with his inimitable charisma, or just taking it easy and allowing admiration of his beauty, Creator was always larger than life. Creator, August 2009. Photo by Beth. Creator. July 2014. Photo by Laura. I could tell a million stories if I could see the screen though my tears. There’s no end to what Creator did, or the things about him. His effect on imaginations, admiration, and hearts was extraordinary. Clearly, Creator touched more lives than I have any idea of. So it feels right to step down and invite others who loved him to help with the words I can’t find. If you want to share a memory, an impression, about Creator, please sharea comment. Joining together can’t blunt the loss, but at least as we miss him, I hope it will help that we’re all in this together. Williamstown 1990-2015. Photo by Laura Battles. One Friday around noon in December 2007, Michael got a phone call from Aubrey Insurance Agency in Lexington. Lisa, the staffer who called, was a racing fan. 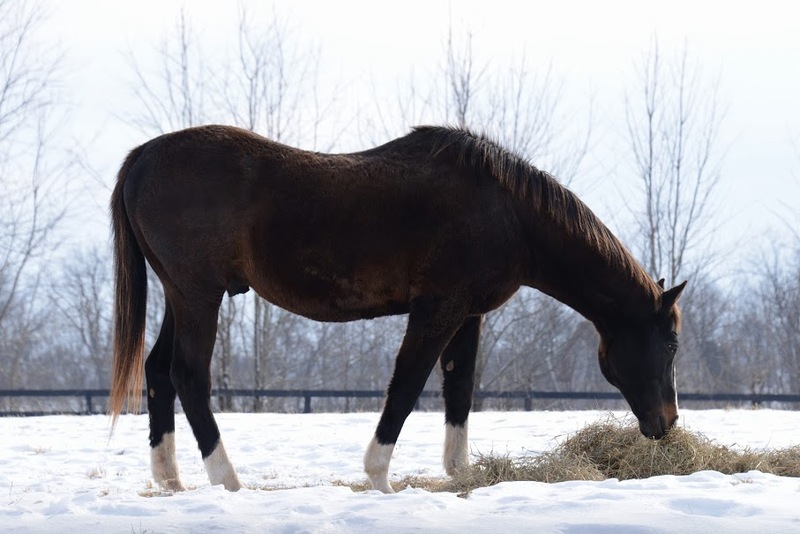 A 17 year old stallion had been pensioned due to infertility and, having not worked out at an equine program at the University of Minnesota, was scheduled for euthanasia. “We’ve got to do something!” she said. “It’s Williamstown we’re talking about!” Do something, Michael did. He spent the day on the phone, tenacious as a bulldog, until he got to the people who needed to be got to. By that afternoon it was all arranged. 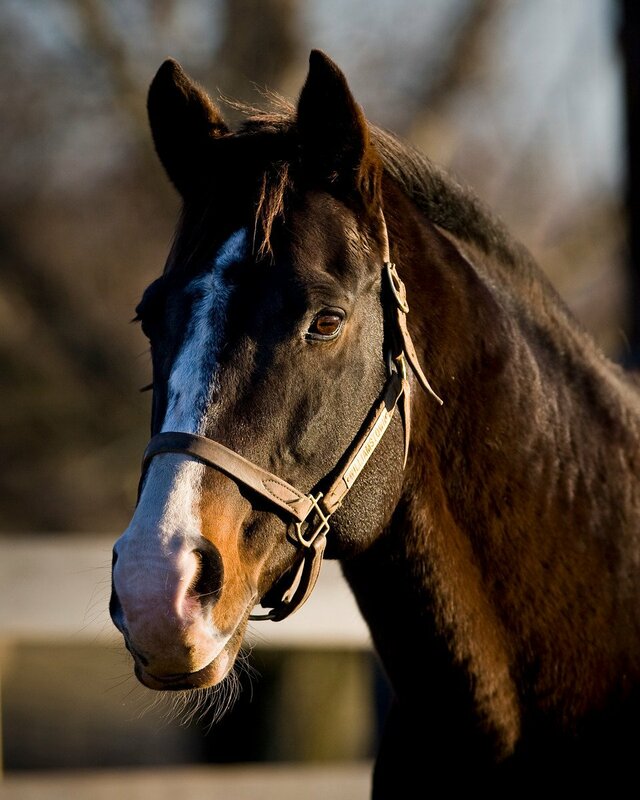 Williamstown, one of the best sons of Seattle Slew, was coming to live at Old Friends. Williamstown arrived at the farm a few days later. 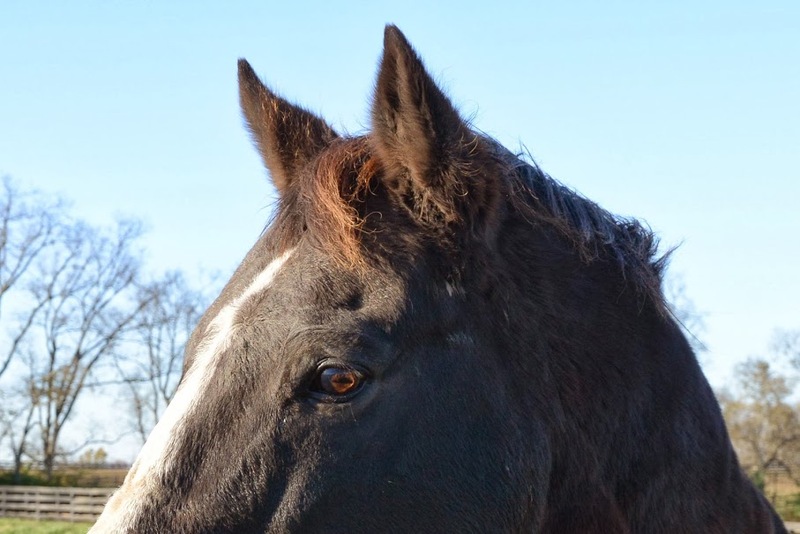 He was—and stayed through the very end—one of the most magnificent looking horses Old Friends has ever had the privilege to care for, a big horse whose nearly black coat was complemented by four flashy white legs and a broad white blaze. His racing career had also been distinctive. When he set his mile record at Belmont in the 1993 Withers Stakes, he bettered the time set by Conquistador Cielo, who was carrying 111 pounds. Williamstown held that mile record for ten years. To break it, Najran had to equal Dr. Fager’s world record, and was carrying 113 pounds. Williamstown had been carrying an impressive 124 pounds. 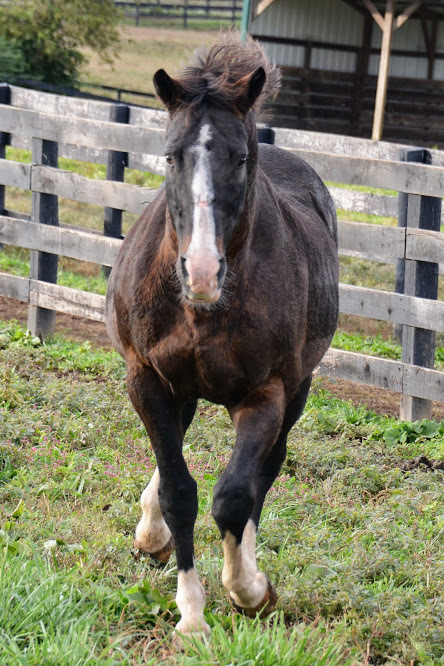 At 17, perfectly healthy aside from infertility, Williamstown wowed us as he got to know his new paddock by putting down his head, stretching his muscular body out long (shades of his great dad!) and running faster than any wind. He was a gorgeous sight thundering around, or flashing out his white legs in play, neck arched. And he put himself on duty immediately, taking on the job of guarding the farm. A house was being built nearby, and William kept his vigilant eye on the construction workers, making good and sure they toed the line. 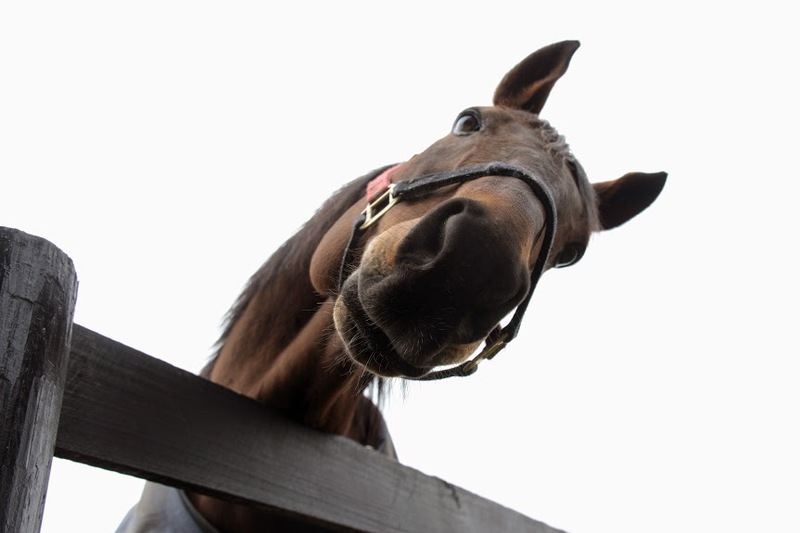 There was no way they were going to come build a house in his paddock! As he aged, time told on the splendid stallion. The arthritis in one of his back legs caused him increasing mobility problems, though William continued to have good spells where for weeks or months, when the mood took him, he’d tear around his paddock like a cyclone. He could be a bit independent, maybe even aloof. He was tough, too. But with his friends, Williamstown was open, willing to meet you more than half way, and kind. He was too dignified to be a cuddler, but in his way he showed affection. He made you earn it, but if you did, he was generous. When it was time to go, William let us know in no uncertain terms that he felt it was the right time to go. He went peacefully, calmly, with the confident assurance that had characterized him all his life. Williamstown was a horse with absolute class.